Hiking is one of the top tourists' attractions in Europe, for many tourists, their trip to Europe is incomplete without hiking. Excellent landscapes, thrilling terrains, and overwhelming heights make hiking in Europe fun. If you want to take a break from your hectic routine and activities, apparently hiking is an excellent way to get past daily stress. The good news is there are many best places to hike in Europe that gives you a break for stressful activities. Just like few other continents, Europe is a continent where you can get the best places to hike. 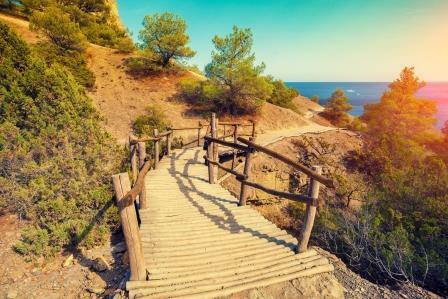 However, to derive maximum fun and thrilling experience from hiking, you need to know the best trails to hike in Europe. One of the benefits of hiking in Europe is that it helps you achieve all your hiking desires. It provides you with the best terrains, hills, and mountains for hiking. Europe also avails you with a hiking adventure that exposes you to the rich culture of different countries in Europe. No doubt, different hiking places have a historical heritage which remains relevant from age to age. The natural and classic hiking trails in Europe make it a place to consider for hiking. Besides, for adventure and exploration, the best backpacking places in Europe provide you with incredible hiking experience. Also, people hike for different purposes, while some people regard hiking as a profession, some hike as a form of exercise. Hence, selecting the best places to hike depends on your nature of hiking. For instance, if you are hiking for professional reasons or as a competition, your choice of places to hike will be different from that of someone hiking for fun or pleasure. However, for whatever reasons you want to hike, it is essential that you master the techniques of hiking. To avoid sustaining injuries while hiking, you need to know how to hike. Are you in Scotland and you are looking for the best place to hike? Do you want to have a thrilling hiking experience? Then search no more, West Highland Way is the best place to hike in Scotland. The West Highland Ways is one of the most popular trails in Europe. West Highland Way has the first long-distance trail, and it remains one of the great places to visit in Europe. The trail also connects to Milngavie, Glasgow and Fort William, offering a variety of landscapes. Selecting The West Highland Way as your hiking trial gives you the advantage of sighting the finest and breathtaking scenery in Europe such as Loch Lomond, Ben Nevis, and the Trossachs National Park. When selecting places to hike in Europe, Lauterbrunnen valley in Switzerland is a place to reckon with. Lauterbrunnen has its location in the heart of Swiss Alps which makes it a perfect location for hiking. The magnificence of the landscape, the thundering waterfalls, the magnificent valleys, the colorful alpine meadows and some other striking features of the valley makes it a famous place for hiking. Lauterbrunnen valley is the best place to visit and enjoy a perfect breeze or feel the touch of crisp mountain air. In a word, little wonder families and folks prefer to hike in Lauterbrunnen. Another perfect hiking place you can visit in Europe is Tour de Mont Blanc in France. Being one of the long-distance classic trails in the world, Tour de Mont Blanc catches the fancy of a long trekker as it requires 11-day hiking with a long-distance of 10,000 meters to trek. Tour de Mont Blanc also provides hikers with the best hiking views and mountains during their adventure. Although it is rigorous, it instills a perfect hiking experience into hikers. For hikers seeking rich geological history, Flysch route is an awesome place to hike in Europe. The vast and impressive rocks and cliffs at Flysch route show the uniqueness of nature. Also, the hiking trail is rich in historical heritage, and the Flysch cliffs and rocks are said to be 60 million years. The landscape, cliffs, and rocks at Flysch make hiking there a remarkable experience. Lac Blanc is also a wonderful place to hike in Europe. Being a high altitude mountain lake surrounded by rocks, it serves as a perfect hiking trail. Also, Lac Blanc being one of the famous Chamonix Valleys serves as a perfect attraction for tourists in Europe. Hiking at Lac Blanc is pleasurable, thrilling and adventurous. Westweg or west trail in the black forest of Germany is one of the long-distance hiking for hikers. For trekkers who love long distances, Westweg is the perfect place to visit. Also, Westweg has excellent scenery with a perfect blend of farmland, forest, mountains, vineyards, and orchards. The Slovenian Mountain Trail is the top walk in Slovenia and one of the best trails to hike in Europe. The mountain trail cuts across mountain peaks, valleys and to the sea which makes hiking interesting. For lovers of long distances, the Slovenian Mountain trail is a top pick as it rewards you with excellent views and outstanding experiences. For a thrilling hiking experience, visit the Transylvanian Mountain Trail. This mountain trail has breathtaking mountain peaks, valleys, forests and other images that will make you want to hike again. For nice hiking trails, Plitvice Lakes National Park in Croatia is a place to visit. As one of the best visiting places to hike in Europe, Plitvice is a blend of waterfalls, forest, and terraced lake. Of course, Plitvice Lakes is a unique attraction in Europe as its beautiful waterfalls and lakes make you want to hike again. Walker's Haute Route in France is also one of the best trails in Europe. It has certain peculiarities that attract hiking enthusiast to it. Its high and rocky trails, snowy peaks, high meadows, and deep valleys make it a favorite place for hiking. One cannot exclude Zillertal valley in Austria from the list of the best places to backpack in Europe. Zillertal valley has naturally beautiful mountains, and its surrounding rugged alps make its exploration thrilling. Zillertal valley also provides you with the best views and scenery across different parts of the valley. There is a peculiarity of this hiking trail that attracts tourists to it. The scenery and cliffs at Stavanger leave tourists in awe. Also, the scenic attractions, exquisite surroundings, high mountains, cliffs, and peaks are what make hiking in Stavanger exciting and captivating. However, hiking in the best places in Europe goes beyond nature walk, it exposes you to the rich cultural heritage of the continent. Also, many of the hiking trails in Europe connect with rich historical facts. By hiking in Europe, you don't only derive pleasure and health benefits but also experience nature in the form of beautiful scenery and pristine landscapes. The views of valleys, high mountains, amazing landscapes, beautiful forests, cliffs, and peaks make hikes in Europe captivating.